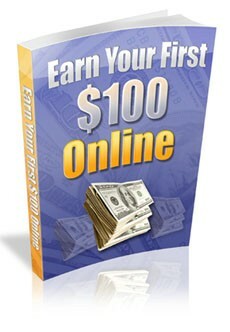 If you follow the methods in this book you’ll make your first $100 online. The techniques and processes I explain will feel weird and alien the first time you do them. You’ll get some things wrong and have to start again and all in all, it’ll be a steep learning curve. Stick with it and you’ll see the profits come in. There’s more to it than that though. If you see this method through to the end – that is until you’re actually banking money that YOU have made online, then I promise you your life will change. You’ll see the potential of the internet and a huge feeling of pride will swell up inside you because YOU have taken nothing but an idea – this book – and turned it into cold hard cash. That puts you in the 5% of people who actually do something with information – no mean feat in itself. But I said there were more rewards than your first $100, and there are. You can quit your job, go full time on the internet or whatever you want. It’ll free you from someone else (i.e. your employer) deciding what you’re worth and put control of your own earning power firmly back in your own hands. That’s a rare thing in today’s world. It’s about changing your life, becoming your own person and taking back control. You do this and you’ll never ever look back. Quite honestly if you wouldn’t be able to go back to a full-time job even if you wanted to because your mind, your potential, your vision of what earnings you can achieve will have been stretched and they’ll never ever return to their old limits. You’ll be a new person. On a practical level too, this book will take you through exactly what you need to do to start earning money online, without the need for your own product or any experience of online marketing whatsoever. From the basic first steps, right through to expert level ‘tweaks’ which will optimize and increase your profits and put your earning on autopilot. Even better, I’m going to give you the skills you need to repeat the process over and over again, as many times as you wish and effectively remove all limits from your earning potential.